An ISO2009:2008 approved company, we are merchant exporters of raw cotton, cotton yarn and cotton by-products (comber noils, linter and cotton seed oil), to essential textile markets like Indonesia, China, Malaysia, Thailand, Hong Kong, Croatia, Pakistan, Bangladesh, and Japan. We have local presence in key markets with teams of experienced professionals who are focussed on delivering, high value-driven cotton export solutions through strategic insight, category expertise, rigorous quality control and precision. 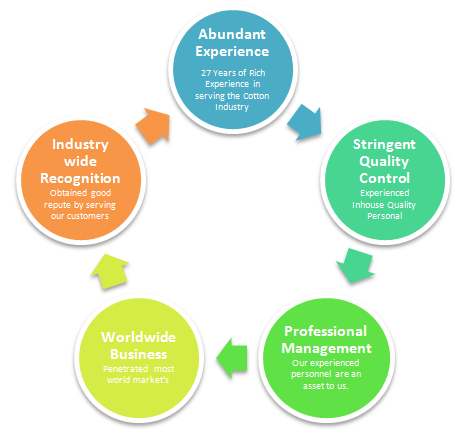 Led by the vision of building a long-term relationship with each of our customers, stringent quality control and providing value for money is the key focus area in our cotton and by product exports. As our specialists are guided by international quality standards, they strictly adhere to standard operating procedures (SOPs) checking for compliance with contract terms and requirements of the destination country. Strongly rooted in our confidence is quality and in-house expertise; with first time clients, enjoying the option to inspect production and delivery at our site. They can also appoint a Third Party Quality Controller (3PQC) for pre-shipment and post-shipment inspection to monitor our compliance with quality. These agencies include professional agencies like SGS or Wakefield. We insist upon clear, honest and transparent payment terms. We accept T/T, Letter of Credit (LOC) at sight or for 30/60/90 days from a prime international bank. To follow a “just in time” strategy – delivering products in a time bound manner and helping reduce costs. We deliver shipments on CNF (Cost & Freight) or CIF (Cost, Insurance, freight) or FOB (Free on Board) basis. Shipments are completed within a month from the order LC date, even shipped within 10 days for urgent requirements.